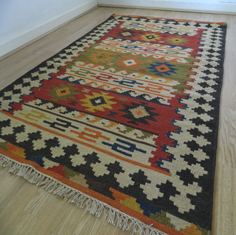 Caucasian Kelim rugs, part of our hand-woven Kilim range of flat-woven rugs. This range features popular patterns inspired by Inca and Aztec traditional designs, woven in multi colours. Produced from a unique blend of New Zealand and Argentinean wool. Available in four stocked sizes which includes a large size and a hallway runner.